The mechanics of this sleight are virtually the same as those used for the vanish of the large ball in the Ramsay Cups and Balls routine. Actually it is easier with a coin. 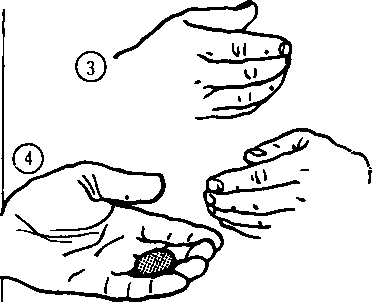 Show a coin at the fingertips of the left hand and then transfer it to the right. After the transfer the left hand should be held in a slightly cupped position about waist high with the back of the hand towards the spectators. It should be kept in this position throughout the entire sleight (Fig.l). Look up towards the ceiling and then back to the coin in the right hand. 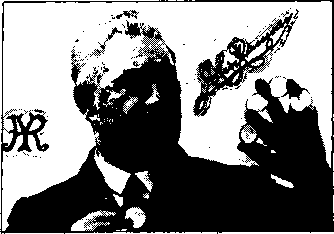 Throw the coin (do not spin it) into the air for a height of about six inches above the left hand (Fig.2); as it descends bring the right hand over the left to catch the coin (Fig.3). The hands do not touch each other, there should be a gap of about two inches between them as the coin is caught in the right hand. Do the throw and catch again. 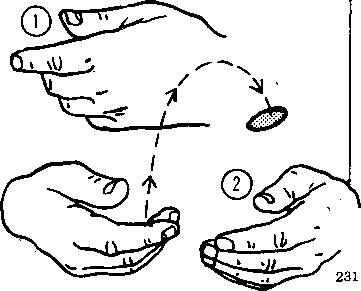 Toss the coin for the third time, but this time as the coin falls, slightly delay the catching action of the right hand letting the coin fall onto the left hand which being slightly cupped and back to the spectators it is out of sight of the onlookers (Fig.4). Do not try and palm the coin when it falls into the cupped hand. From the commencement of the first throw until the coin is in the left hand there should be no movement whatsoever of this hand or its fingers. You may be wondering why the spectators do not see the coin as it passes the gap between the hands. The answer is a simple one — MISDIRECTION. At the exact moment the coin starts to fall, look up towards the ceiling. This draws their eyes away from your hands for the split second needed for the coin to pass between the hands. The right hand having closed apparently holding the coin moves to the right. Look down at the hand and lower it as if to make a throw, and then look at the ceiling. Raise the hand again, hesitate, look at it once more, lower it again and look towards the ceiling for the last time. Make a throwing motion with the right hand, opening it at the same time. Let the audience see that it is empty, but do not look at it yourself, you should be looking vainly in the atmosphere for a coin. Having failed to find it, you re-produce it from the elbow or from behind the back as John Ramsay did. It cannot be emphasised too strongly that from the first throw the left hand and its fingers must remain still and in the same position until the hand moves to reproduce the coin. Without the use of the misdirection described the move will not deceive anyone With it, the illusion is so perfect that the coin will seem to disappear in mid-air. John normally used a copper coin for this vanish, it being less likely to 'flash' than a silver one, so making the 'concealed drop' less conspicious. Malini said it was "The Eye". Ramsay said it more fully when he said, "If you want someone to look at you, look at them", and "If you want them to look at something, look at it yourself." Both were talking about the same thing, namely, their personal theory of misdirection. In some ways their methods were similar, but I believe that Ramsay explored and refined the art of misdirection to a greater extent than any other magician before or since. Malini learned his trade under very tough conditions, busking and entertaining in saloons, where the customers were not too polite if he made a slip. As a young boy John used to watch the assorted tricksters and con-men who worked the race-course in his home town of Ayr. He quickly learned that these characters had to be good, their very life and limb depending on it. During a long period of close scrutiny he analysed their methods and adapted them to his magic. I have already explained Ramsay's approach to misdirection in 'The Ramsay Legend', and of this book Dai Vernon said "that only six people in the world would really appreciate it". I would go as far as to say that probably even less tried out the principles. Let us go over them again briefly. We all know that the audience will look in the direction the performer looks. Therefore, if you are about to perform a sleight, one way to take their attention away from your hands is to look at them and make a remark, ask a question, or just smile. Another is to direct their attention to an object on your table, or pick up the object with one hand and look at it while making a secret manoeuvre with the other. Timing is important. If your misdirection is too late the audience may catch your ¿nove, if on the other hand it is too early they may have transferred their attention back to your hands just in time to catch the sleight. In other words, apply the misdirection a fraction of a second before you make the move. Of course if you can do your sleights so perfectly that you feel you do not need any cover, then just forget this, but why take chances when a little thought and practise can pay such high dividends by making sure that you never get caught. Try the following experiment. Take a trick you have been doing for years, one you think you know really well, and see if you can apply the methods I've explained. Take it move by move and try and work out the best and most natural cover for each one. You may find that simply looking at the audience could be the best cover for one sleight, while directing their attention to something, or someone, may be better for another. Once this has been done practise the complete routine a few times concentrating on the misdirection, then do it for somebody. You may be surprised at the reaction, especially if they have seen it before. It can also increase your confidence which in turn will make your performance smoother having the knowledge that your moves are covered. Using misdirection has the added effect of improving the presentation of the entire act. By looking at your audience, you get them to look at you, or more specifically at your face, and this helps you to put over your personality. This is one of the important, if not the most important factors, in performing magic successfully. When John Ramsay was trying to give up smoking he would sometimes pop one of those cardboard imitation cigarettes in his mouth to try and satisfy the craving. He soon realised that by cutting them in half, not only would they last twice as long but they were also easier to 'tongue'. Here is one of the gags he frequently pulled whenever he travelled by bus. 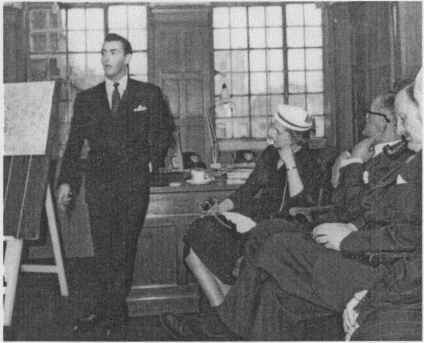 He would always try and get a seat downstairs where smoking was not allowed, and as near to the door as possible. After getting a ticket from the conductor, John would roll it up and conceal it in his hand. The conductor would invariably reprimand him for smoking downstairs. John would mumble an apology, raise his hand to his mouth, tongue the 'cigarette' and throw the rolled up ticket out the door. The conductor would see something fly through the door and assume it was the cigarette. His surprise can easily be imagined when he looked round and saw that it was back between the lips of that seemingly absent-minded old gentleman!